The first appearance over Japan in June 1944 of the massive four-engine B‑29 bomber—with its service ceiling of 33,000 ft, an operational range of over 3,200 nau­tical miles, and a maxi­mum take­off weight of 133,500 lb—meant that the enemy’s home islands were squarely in the cross­hairs of the war’s dead­liest delivery sys­tem. On this date in 1945 the Japa­nese capi­tal wit­nessed its first in­cen­diary raid when 174 China-based B‑29 Super­for­tresses returned and de­stroyed roughly one square mile of the city and approx­i­mately 28,000 build­ings. 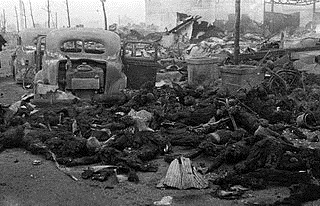 The blast-and-burn cam­paign against Japan’s highly com­bus­tible cities was the brain­child of Maj. Gen. Curtis LeMay. Having pre­viously served in the U.S. Eighth Air Force in Europe, LeMay saw how the in­cen­di­ary cam­paign over Ger­man skies had played out, and he brought the con­cept with him when he assumed com­mand of B‑29 opera­tions, first in China, and then command of all B‑29 oper­a­tions in the Pacific. The trans­planted LeMay made a radi­cal depar­ture from the current high-alti­tude, day­time “pre­cision” bombing prac­tices using con­ven­tional ord­nance on Japanese targets—prac­tices that so far had been un­able to de­vas­tate the enemy’s war in­dustry, cause gene­ral econo­mic chaos, and destroy civil­ian morale. On the night of March 9–10, 1945, LeMay sent his B‑29 wrecking balls loaded with na­palm (jellied gaso­line) bombs over Tokyo at low altitude. Oper­a­tion Meeting­house (“Meeting­house” being a code term for the urban area of the Japa­nese capi­tal) was the single most de­struc­tive bombing raid in history: 100,000 peo­ple died, 25 per­cent of the city was de­stroyed (267,000 buildings), and more than a mil­lion inhab­i­tants were made home­less. In the en­suing five months, low-level night­time area bombing with na­palm bombs des­troyed or heavily damaged 67 Japa­nese cities. In more than 31,300 B‑29 sorties over the home islands, just 74 Super­fort­resses were known to have been lost wholly to enemy inter­cep­tors (a mere 0.24 per­cent of effec­tive sor­ties) and perhaps 20 more in con­cert with flak guns. Many more Super­forts were lost in acci­dents during take­offs and landings. The most famous Super­for­tress was named Enola Gay, which on a sep­a­rate com­bat mission led by Col. Paul Tibbetts dropped a high-explo­sive bomb with the force of 12.5 kilo­tons of TNT—the first of two atomic bombs—that led to Japan’s capitulation on August 15, 1945. 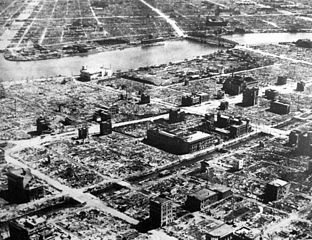 Left: Tokyo after the massive saturation firebombing of March 9–10, 1945, the single most de­structive raid in mili­tary avi­a­tion history. 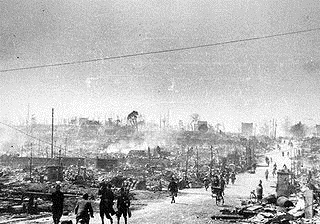 Over 50 per­cent of Tokyo was reduced to ashes by the end of World War II. Right: Tokyo after the surprise March 1945 nighttime bombing raid, which left more than one mil­lion resi­dents home­less and the city’s in­dus­trial pro­duc­tivity cut in half. LeMay had bet his repu­ta­tion that Japan, by this date, had few night fighters avail­able, so that the U.S. strike force, maxed out with bombs (each B‑29 was 13,000 lb overweight!) and flying at low alti­tude (5,600 ft), would not be sub­jected to nor­mal air-to-air oppo­sition. Tokyo was again razed on May 23 and 25, leaving three mil­lion residents now home­less. 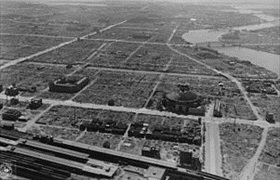 In May 1945 alone one-seventh of Japan’s built-up urban area—a staggering ninety-four square miles—had been devastated in the firebombing campaign. Left: Citizens walk through a rubble-strewn neighborhood following the March 1945 firebombing. Emperor Hirohito’s tour of the destroyed areas of Tokyo in March is said to have been the beginning of his personal involvement in the peace-making process. 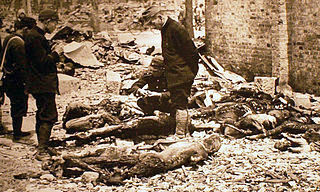 Right: Charred remains of civilians after the March 9–10, 1945, firebombing of Tokyo. Left: Authorities try to identify the victims of Tokyo’s firebombing. Raids on Tokyo lasted until August 15, 1945, the day Japan capitulated. 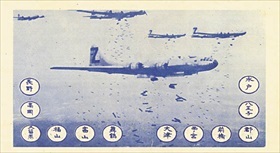 Right: A “LeMay Bombing Leaflet” dropped late in the firebombing campaign, urging Japanese citizens to evacuate cities named on the leaflet and save themselves.